Last week a user by the name Vittoriohp joined my server and spammed emitters to try and crash it. I searched his ID (76322) and found he did something similar earlier this year. Today I was on based rlcbm's server and ran into him again. If you are hosting a server with building enabled and this guy joins, keep an eye on him and be prepared to ban him. 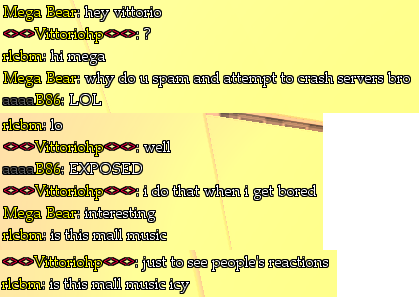 He crashes servers by spamming emitters and bricks. Vittoriohp, ID 76322. This is the first drama I’ve made in like 5 years did I do ok? This kid shat up Deokotarus freebuild a while back with green autism spam so it doesnt surprise me hed do this.